For all moves, we wrap your furniture in padded moving blankets at no extra charge. We offer low hourly rates that are all-inclusive of the workers, truck, fuel, tools, and disassembly and reassembly of your furniture. Our movers are strong, careful, speedy, courteous, and accommodating to any request. We service all of New England as well as New York, and we will move you to or from anywhere in the USA. We coordinate shipping services for overseas moves. White glove services are offered for interior designers, furniture stores and individuals, including receiving, inspection, delivery and storage. Do you need special services like piano moving, junk removal, hoisting or moving furniture around within your home? Just give us a call and we will take care of it all. We can store your possessions for as little or as long as you need in our fully insured warehouse. 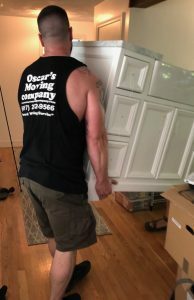 Oscar’s Moving knows Boston. We have moved thousands of folks throughout the Boston area. We know all the ins and outs – from getting a parking permit for moving day, to getting the insurance certificate that your building requires. New England trusts Oscar’s, and Oscar’s is proud to be here for you. We will get you moved!